We have frequently characterized as "dizzying" the interrelationships and incestuousness among the various people and organizations that seem to govern, influence, and fuss at us at every turn. Let's take a look at a couple of recent examples. The Trojan Heron, on the other hand, is an angry anonymous blog, which is my main criticism of your association with it. Someone who spews opinion without the courage of assigning his/her name to it, does not have my respect, nor should they have yours or your platform. On the TH random slinging of accusations at people as if hoping that some of it will stick smacks of self indulgence in the extreme and truly serves no useful purpose. Is this really what you want to offer to our community? You can read her entire letter at this link. Sarah Crosby is on the Byers Campaign Committee, a member of the (nonpartisan) League of Women Voters, a PCO for the San Juan Democratic Party, a donor to the Pratt campaign, and Chair of the Advisory Council of the Madrona Institute and ex-officio member of the Madrona Institute Board. The Madrona Institute and its founder, Ron Zee, are busy setting up (what amounts to) an alternative governmental structure here in the islands. We have already brought to light that Zee/Madrona is the local fiscal agent for the Puget Sound Partnership (PSP), taking a modest 5% to 10% off the top of all PSP grants that get distributed to our local Stewardship Network. Remember, the Stewardship Network is a group of 24 local groups who have been paid by the PSP to spread the word that Puget Sound is in trouble and that our environment is our economy. The Stewardship Network includes the Friends of the San Juans, Kwiaht, the Conservation District (of which Zee is President), and five separate County entities (ARC, MRC, Land Bank, Noxious Weed Board, Salmon Lead Entity). Theoretically (or perhaps not so theoretically), the linkage of the PSP-Madrona Institute-Stewardship Network presents an alternative funding route for County projects without the County entities having to receive Council approval. Now we find out that Ron Zee wants to appoint Kyle Loring, the Friends staff attorney, as an associate Board member to the Conservation District (Loring's wife is already on the Madrona Institute Advisory Council). Nearly simultaneously, we learn from the February 6th meeting of the PSP's Action Agenda Oversight Group (AAOG) that their plan is to offer Ron Zee the Chairmanship of the AAOG/LIO, and part of those responsibilities may entail PSP funding of the Conservation District, of which Zee is president. Also remember that Zee was Chair of the local Democratic Party last year, and he headed up the endorsement of candidates Byers, Pratt, and Stephens. While our attention has been focused on the elections, CAOs, and various lawsuits, the "fourth candidate" (Ron Zee) has been moving ahead with the consolidation of his power over everything subterranean in this County -- the Conservation District, the Stewardship Network, ECONet, AAOG/LIO, and grant funding going to those groups via the Madrona Institute. Each of those entities, in turn, has tentacles that reach out to state authorities, visioning events, long-range planning activities, and all manner of stomach-churning bureaucratic power levers. We may be in the midst of Council elections, but Ron Zee, inventor of the CRC "Better Government" Zee Wheel, is already the boss. An early proponent of some of the early ideas around community land trusts in this country was Thomas Paine. He wrote, "Man did not make the earth, and though he had a natural right to occupy it, he had no right to locate his property in perpetuity on any part of it. It is the value of the improvement only, and not the earth itself, that is individual property. As fallacies go, this one is a whopper. It's a whole bunch of fallacies actually, but it is mainly a fallacy of anachronism, where we judge one time period (the 18th century) by the standards of another (the 21st century). No, Thomas Paine was not predicting or advocating for community land trusts back in the 18th century. The Byers quote attributed to Thomas Paine can be found in his essay Agrarian Justice, which is a continuation of Paine's earlier work, Rights of Man, in which he defended the French Revolution. In fact, Agrarian Justice was originally written in French, published in Paris, and specifically addressed "To the legislature and the Executive Directory of the French Republic." When reading Paine's essay, we have to recognize that we are reading a social justice essay written at a time when there was no social justice. We are reading the thoughts and ideas of a man who grew up in feudal England, with its landless peasants and landed gentry. And the entire system was backed by a church that preached that God made the rich and the poor, and the rich nobility were ordained, by God, to be rich and powerful rulers over the poor in perpetuity. Paine grew up in a land where there were no property rights, unless you were the hereditary aristocracy. Paine simply rejected that whole system and was encouraging the French to do the same. Paine believed that God ordained neither the rich nor the poor; God only made male and female (in Paine's words), and that every person should have a right to own land and its productive capacity. Paine was arguing for the American-style democratization of land in France, rather than common land per se. He said that Europe's pattern of feudal land ownership (i.e., the civilization of the day) had made the vast majority of its inhabitants miserable. In taking the matter upon this ground, the first principle of civilization ought to have been, and ought still to be, that the condition of every person born into the world, after a state of civilization commences, ought not to be worse than if he had been born before that period. But the fact is that the condition of millions, in every country in Europe, is far worse than if they had been born before civilization began, or had been born among the Indians of North America at the present day. I will show how this fact has happened. And Paine was right. In Agrarian Justice, he proposed a new style of land ownership so that the productive capacity of land was put to use in ways that "civilized" European society never dreamed of. In so doing, Paine advance a specific idea that advocated the use of an estate tax and a tax on land values to fund a universal old-age and disability pension, as well as a fixed sum to be paid to all citizens upon reaching maturity. I do not believe Paine would support any current concept of common ownership rights in the private property of others. And I certainly do not believe that Paine was advocating for all land to be owned by grant-funded non-profit 501(c)(3) corporations rather than individuals. Looks Like The Election Is On! 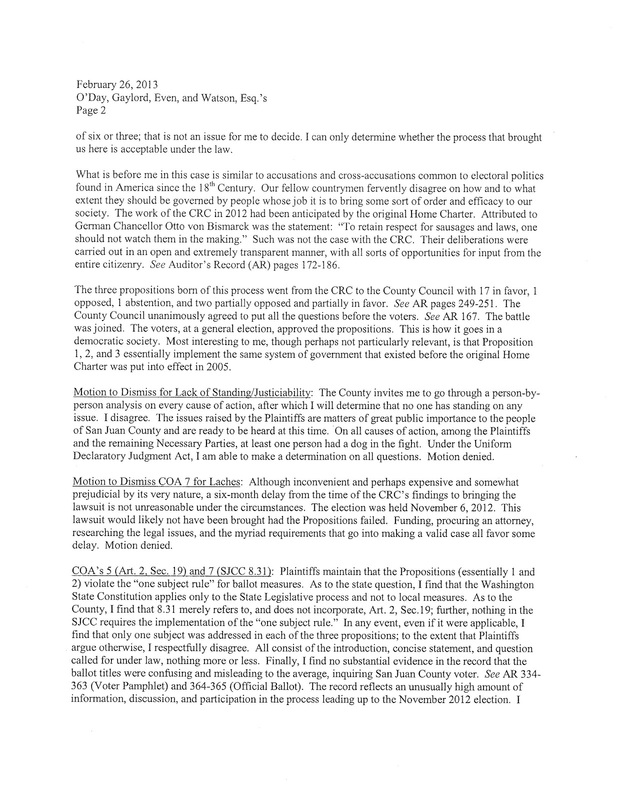 I know we said the next post would be about Thomas Paine, but a ruling has come down about the Proposition lawsuit. All causes of action have been dismissed. The ruling is posted as an image below. Sometimes it seems like Trojan Heron compliments about County government are as rare as hen's teeth, but we'd like to pay a rare compliment to the Winter Council for their efforts yesterday. Mind you, the Trojan Heron agrees with the dismay our commenters have expressed regarding the Community Conversations; however, yesterday the Winter Council had a conversation/workshop with its Citizen Advisory Committees, and we applaud that conversation. It's about time that conversation took place. More please. For several hours, the Council discussed Committee alignment with Council goals, communications, rules, and vacancies/term limits/appointments. Patty Miller prepared a summary of all those parts of the County Code that pertain to Committees (bravo), and ideas were discussed for liaising with the Council. Committee workplans were seized upon as one new (old) way to improve coordination between the Council and the committees. It's a new (old) way since workplans are actually required by the County Code already, as is annual training for Committee members. We just haven't been following our own legal requirements for our Committees. There were many questions, and as sorely needed as the workshop was, it served to illustrate how much further we have to go to get this place under control. But it was a step in the right direction. We need many more. Next post we'll deliver on our promise to comment on the Thomas Paine reference in the Lisa Byers video. 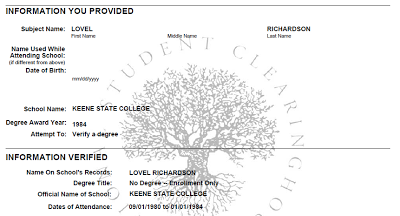 Yes, the registrar from Keene State has confirmed that the previous information they provided about Lovel Pratt (née Richardson) was erroneous, and she does, in fact, have a BA from Keene State. The comment in the previous blogpost is authentic, and we thank Tom Richard (Keene State Registrar) for clearing up the confusion. 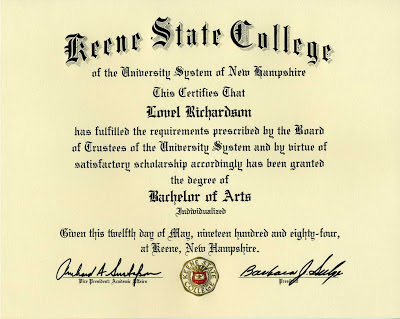 As the Registrar at Keene State College in Keene,NH I am in a position to verify that Lovel Richardson Pratt did in fact earn a Bachelor Of Arts degree on May 12, 1984. The date of the award preceded our reporting of such data to the National Student Clearinghouse. We also changed our student information system in 1998 so current active records don't include Ms. Pratt's academic history - thus the initial negative response from Ms. Wheeler, a staff assistant in the Registrar's office. We have had a lot of inquiries about the Pratt diploma story today, so for the sake of clarifying the background on this story, here is some additional information. When it was first noticed that Pratt was claiming to have a degree from Keene State, reports began to surface that she had specifically denied having a degree at the time of her 2008 candidacy. According to the memory of some San Juan Islanders, Pratt had been very explicit during the 2008 League of Women Voters events that she had left college without ever attaining a degree. To check for background facts and documentary evidence, a request was submitted to the National Student Clearing House for degree verification. This is the same service used by employers for degree verification, and it is the service recommended by the website of the Keene State registrar's office. You can see the response from the National Student Clearing House below. It clearly states that Pratt (née Richardson) did not attain a degree. Simultaneously, and not being content to simply rely upon the results from the National Student Clearing House, email inquiries were sent to the registrar's office of Keene State. As shown in the previous blogpost, the registrar from Keene confirmed via email that Pratt does not hold a degree according to their records. Subsequent to receiving the registrar's email, follow-up phone calls were placed to the registrar to confirm the content of the emails and to inquire whether Pratt's degree might be misfiled under another name. The caller was assured by the registrar staffer that records at the Keene registrar's office are filed according to social security number, not by name, so even a person with multiple names, but the same social security number, would be captured by their records. This is one heckuva story since someone (Keene State or Lovel Pratt) has their facts completely wrong. As we said in the last post, stay tuned while we try to sort out this strange story. This is the image of the diploma that Pratt has produced tonight. Now, we just have to figure out why Keene State College, as stated in email correspondence and phone call verifications, appears to have no record of this degree. 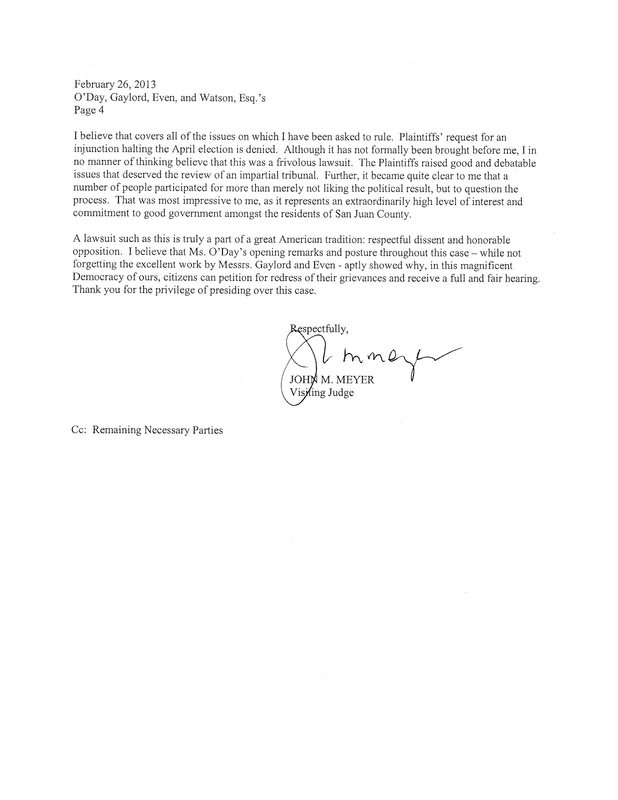 When Lovel Pratt ran for Council back in 2008, she said that she had "attended" Keene State College in New Hampshire (as well as Bryn Mawr and the Anthropology Film Center). You can see her say so in her own words from this old Q&A piece from the Journal. So, it came as a bit of a surprise to read on her campaign website that she had been awarded a Bachelor of Arts (BA) degree from Keene State College. That's funny ... I didn't know Pratt had any degree. She had never mentioned previously that she had a degree, only that she attended Keene State College. And there was no longer any mention of Bryn Mawr either. But perhaps it was just a typo or scrivener's error on her campaign website. 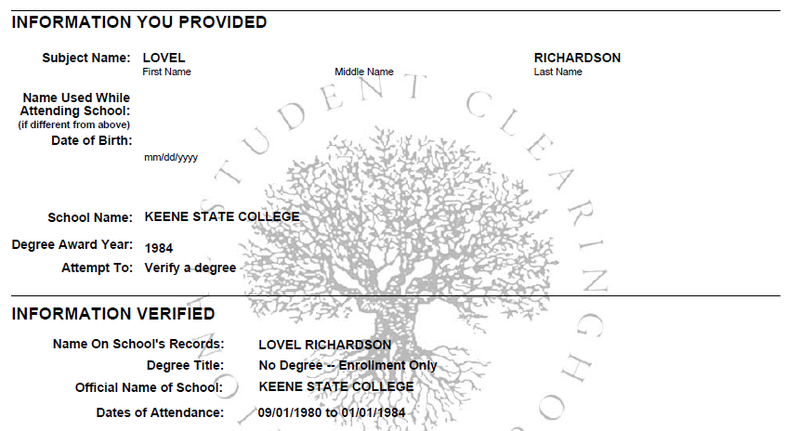 However, Pratt's assertion that she earned a BA from Keene State started showing up other places too. It was listed as part of her candidate's statement for the Eagle Forum. More importantly, it was listed on page 116 of the Voter's Pamphlet from last November's general election. Also, it's listed as part of her current official campaign statement for both the primary and general election that we are now engaged in. 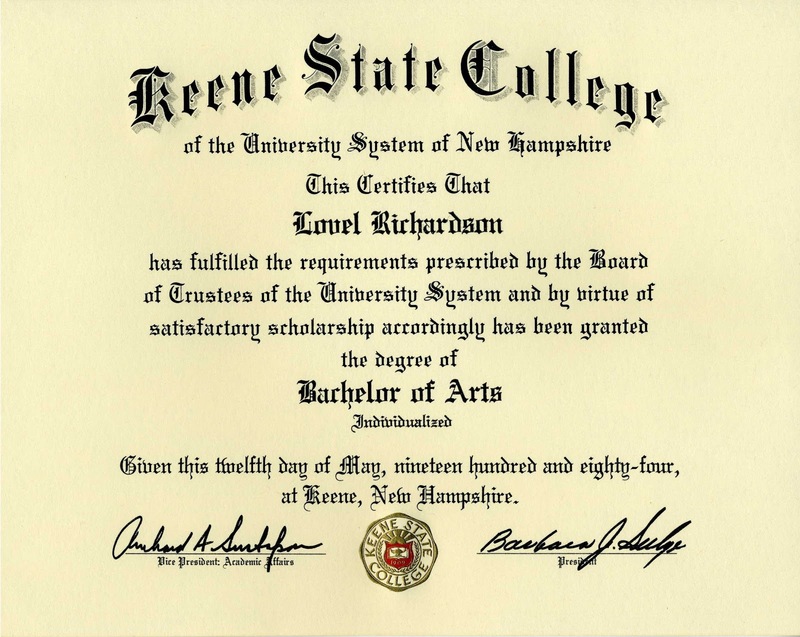 Lovel Richardson, attended Keene State College from 1980 through 1984, however, never received a degree. An email (see the bottom of this post) has been sent around to many realtors regarding Lisa Byers and the video that was posted on the Trojan Heron on February 6th. Lisa Lawrence explains that the video was taken out of context, implying that Byers was simply delivering a lecture in the third person and not speaking about her own views. And here is the video of that quote. Yes, by all means, educate yourself on Lisa Byers and her beliefs ... by doing your own homework rather than simply listening to what Lisa Lawrence says about her. For the full context regarding Byers and the New Economics Institute, take the time to watch some of the other videos that have been posted too. For example, get a load of the talk about Sharing Wealth in the 21st Century, which is posted on the same webpage as the full Byers video. Watch them all. Make up your own mind. After watching the video that Greg forwarded to us I did a bit of research as it was obvious to me that it was taken out of context. Lisa Byers was simply giving a history of how the land trust model of land ownership was developed - nothing to do with private property rights. It makes me sad when this type of rhetoric or misinformation is sent around as if it had some validity. Please educate yourselves if you haven't, on home trusts and the like and how they actually help small, rural communities keep people here like teachers, grocery store clerks, farmers, retirees, families, etc. As much we all appreciate and love the idea of owning our own land outright, it is often an unobtainable dream due to financial reasons. Land trusts make homeownership possible for many folks that would never be able to, by taking the price of the land out of the picture or minimal cost. Lisa Byers is well respected across the country for her work in this field, as well as in our county. I know Lisa Byers and I have the utmost respect for her. In my opinion we are lucky to have such an honest, intelligent, compassionate person willing to serve our community and I am voting her. I hope you all take a minute to read her response below to my questions for her regarding the video and feel free to contact her directly if you have specific questions. I appreciate you asking me about the video excerpt from a talk I gave last year. I was one of three speakers who talked about how a community land trust and a land conservation easement with The Nature Conservancy helped to create the first Community Supported Agriculture farm in the country, Indian Line Farm in Great Barrington, Massachusetts. I spoke about the history of the community land trust model of land ownership. As you may know, my work for the past 17 years has been to support our economy in San Juan County by providing affordable housing that will continue to serve the community for decades to come. The community land trust model is a pragmatic option for a county like ours where real estate prices are higher than the norm and wages are lower than the norm. The way it works is that the non-profit community land trust secures grants and donations to buy land and develop infrastructure for housing. The community land trust leases the land to individuals who own their homes. The grants and donations lower the price a household pays for the housing they purchase. In exchange for being able to purchase a home at significantly below market value, the homeowner agrees, through the land lease, that when they choose to sell, they will sell at a price prescribed by a formula in the lease to keep that home affordable for subsequent generations. I find this model to be a practical blend of progressivism and conservatism, and an example of a successful public-private partnership. Just as with conservation land trusts, public and private funds are invested in a manner that lasts for decades. The non-profit organization stewards that investment by overseeing re-sales at an affordable price. And the individuals who purchase homes under this model have the rights and responsibilities of ownership, which can vest them more fully in the community. If I am elected to serve on the county council, I plan to spend time working on other ways to help sustain a healthy economy. I will help to foster the continued growth of our agricultural sector by re-aligning state and county statues to be more supportive of small farmers. I plan to help with incubating new businesses, assuring that our zoning provides places for island-friendly commerce, helping OPALCO’s broadband service get established, and reforming or eliminating outdated regulations. I am particularly interested in encouraging young people who grew up here to come back to raise their families. Thanks again for asking. I hope this places the video in context. Please let me know if you have any other questions. Today's court hearing regarding the Charter Propositions began at 10:30 am and ended at 5:00 pm. The lawyers arguing the case were Stephanie Johnson O'Day for the plaintiffs and Randy Gaylord and Jeff Even (Washington State Solicitor General) for the defense. Of the named parties, those in attendance were Jeffrey Bossler and Jerry Gonce (two of the three plaintiffs); Council members Marc Forlenza, Rick Hughes, Patty Miller, and Rich Peterson (Jarman is still recovering from surgery); and candidates Greg Ayers, Lisa Byers, and Lovel Pratt. Reporters were present from the Island Guardian, sanjuanislander.com, Sound Publishing (Journal, Sounder, Island Weekly), and Orcas Issues. In the morning, there were about 40 people in attendance, dwindling down to about half that by the end of the day. The audience included former Councilman Richard Fralick, Bob Gamble of Kwiaht and the Planning Commission, Tim Blanchard of CSA and the Planning Commission, Bill Wright of CAPR, and others. The court made no rulings. It left open the possibility of a future evidentiary hearing, but no one is really expecting that to happen. However, the judge allowed one week to accept further declarations and input from the necessary parties. After that, the judge promises to rule promptly well before the general election. As for who "won" today, that seems to be unclear. Each side made best use of the tools that it had. 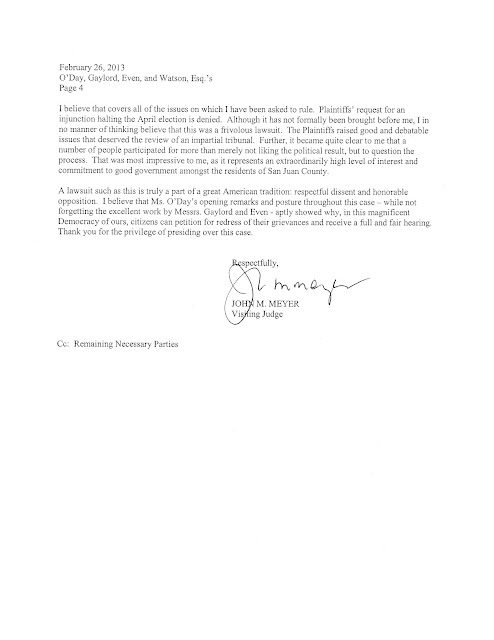 For example, O'Day is getting high marks for persuasively presenting evidence about unconstitutional elements, damage to the Council members who lost out on their terms, points of policy regarding unequal size districts, conflicting ballot language, the "Lopez effect", and other matters related to standing and/or voter confusion. On the other hand, Gaylord and Even were said to be polished and prepared, and according to many, they mounted effective legal defenses backed by substantial case law. In effect, they argued that regardless of the evidence presented by O'Day, no law was broken. Who won seems to depend on whether you were persuaded more by O'Day's evidence than by Gaylord/Even's polish and case law (or the other way around). A few things are clear, however. For example, it seems highly unlikely that the plaintiffs' case could ever be considered frivolous (an allegation made by Gaylord prior to this hearing). Just the fact that the judge held a hearing for 6.5 hours would seem to negate that possibility. On the other hand, frivolous or not, the burden of proof on the plaintiffs multiple causes of action is still quite high. The bottom line is that the whole shootin' match is still in play for both sides, and Gaylord asked the court to consider remedies in the event that the judge is likely to side with the plaintiffs. Today, there is a hearing about the Charter Propositions lawsuit in our local courthouse, and Orcas Issues has quite a good factual summary of where those proceedings stand. Have a look at that article by following this link. If there is anything missing from the Orcas Issues summary, it's the sense that this is a constitutional challenge (both state and federal constitutions). In other words, as far as court proceedings go, this is pretty high drama for our little corner of the world with the CRC results being challenged in both local court and federal court. The local court proceedings get underway today with a hearing that starts at 10:30 am at the Friday Harbor Court House. The presiding judge is Judge John Meyer of Skagit County, who is traveling from Skagit to San Juan County to hear the case in our courthouse. There are a lot of moving parts to this case. 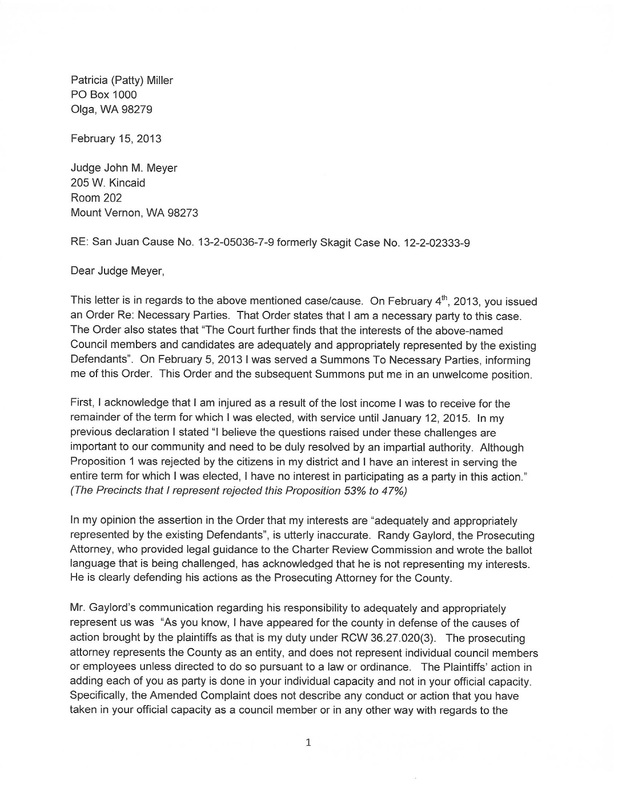 One of the interesting twists is that Randy Gaylord, who is defending the work of our CRC, sought to have all candidates and the current Council members named as parties to the lawsuit. That didn't sit well with some. You can read Patty Miller's response below, which I think eloquently describes her position (click each image to enlarge). There has been a great deal of discussion in the comments about OPAL, so I thought I would post some information related to their finances. Below is information from their 990 Form from 2010 (the latest year I could find online). It shows over $8 million in net assets ($10 million in gross assets), with revenue of over $3 million, which includes public funding of about half a million in 2010. The business model seems pretty sweet. With all the talk about land being held in common, it's easy to forget that someone (i.e., the OPAL organization) actually does own the land, and the economic benefits of land ownership accrue to the balance sheet of OPAL rather than to individual homeowners. OPAL owns the underlying land asset, receives income from the sale of housing, and receives public funding on top of that. That's hard to beat, especially when OPAL receives funding to purchase the land debt-free and receives tax relief for being a 501(c)(3) (and because of County waivers too). The New Economy is very profitable, but it is a model of economic dependency ... dependency on outside subsidy and tax breaks. It is not a model of economic self-sufficiency. It is not a model of economic productivity. In our modern mixed economy, there should always be a place for projects like this of appropriate scale in our communities, but it can never be a model for the whole community. It is unsustainable. One year ago today, we published our first blogpost. 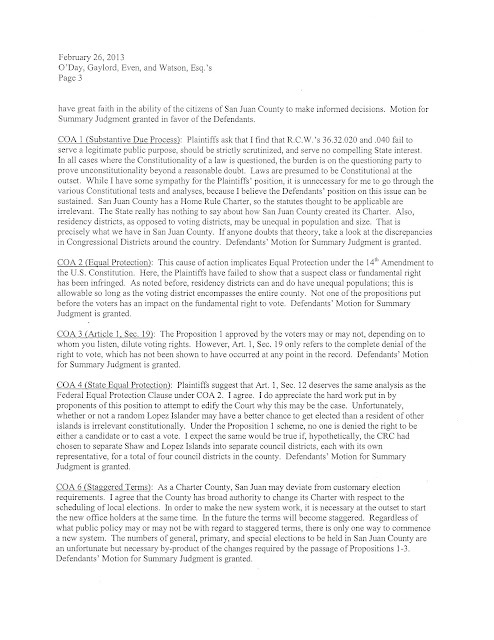 Since then, the County has passed the dreadful and unintelligible CAOs; adopted the second largest budget in County history; added millions to County debt; held two elections; passed the CRC changes; been sued twice (one involving the CRC and one involving the CAOs); is facing two appeals before the Growth Management Hearings Board (GMHB); has held two elections (general election for the Winter Council and a primary for the 3-person Council); and is in the midst of another election. We've seen the Friends manipulate government to abuse our neighbors. We've learned about the Stewardship Network and its coordinated PSP-paid-for-messaging that "Puget Sound is in trouble" and that "our environment is our economy," and we've seen how the Madrona Institute run by Ron Zee has set up a Council-bypassing alternate grant-supply for County entities like the Marine Resources Committee (MRC) ... while it takes a modest 5% to 10% cut. We've had a year of pablum from Sound Publishing (Journal, Sounder, and Island Weekly). We've witnessed hypocrisy (Vivian Burnett) and lies (some yet to be revealed). We've seen the usual vitriol, distortion, and incivility from the very people who accuse others of those traits. We've had candidates run on their records ... and despite their records being filled with secret meetings, New Economics, and dubious connections to everything that makes this place troubling ... a sizable proportion of our neighbors remain unconcerned and uninvolved ... if not supportive. Quite a year. What will the future bring? While turnout was low, Byers and Pratt benefited from comparatively high turnout in the areas that favored them. In the precincts where Byers and Pratt won, average turnout was at least 7 percentage points higher than the few areas where they lost. For those precincts where Byers and Pratt received an outright majority of votes, average turnout exceeded 50% (with Shaw being a notable exception). In absolute numbers, the undervote was greatest in Lopez North (a particular Byers/Pratt stronghold), Orcas West, Eastsound, and Friday Harbor North. Each of those precincts has about 500 more potential votes than were cast in the primary. The only precincts in the county with more than 1,000 registered voters are Lopez North, Orcas West, and Eastsound, so despite relatively high turnout in those precincts, they still had a large number of un-cast votes too. Just the un-cast votes in Orcas Central, for example, are equivalent to more votes than exist in the entire precincts of Turn Point, Blakely, Decatur, Shaw, or Waldron. Byers won in 15 of 19 precincts and had an outright majority in 4 precincts. Pratt won in 14 of 19 percents and had an outright majority in 5 precincts. The numbers prove the tautology that Byers and Pratt won because their supporters turned out in greater numbers than those of other candidates. It looks like the general election probably will come down to who can generate enough excitement to get the vote out, because a lot of our fellow citizens simply did not participate in the primary. For those who might claim that Lopez had an inordinate effect on this election, I would only offer the clarification that, because of the low turnout, it would be more accurate to say that "only about half of Lopez" had an inordinate effect on this election -- we're talking 1,000 Lopezian voters, roughly 700 of whom voted for Pratt and Byers. The rest of Lopez, like most county voters, just didn't vote at all. No substantive change resulting from the latest vote tally announced at 5pm. You can find the results here. Precinct results for the San Juan race can be found here. Precinct results for the Orcas race can be found here. The Byers and Pratt vote was highly correlated. There are many ways to measure that effect, but one way to look at it is to calculate the relative percent differences by precinct and vote totals. For example, the relative percent difference in their vote totals was only 1.5%. No other combination of candidates had vote tallies that were so closely associated with one another. In short, the numbers would support the notion of a voting bloc. Byers and Pratt had overwhelming victories on Lopez, Shaw, and Waldron. Pratt, for example, collected 28% of all her votes from those islands. Byers collected 27% of all her votes from those islands (whereas those islands make up only about 17% of the population). Byers and Pratt did better in each other's districts than in their home districts. In other words, Byers did better on San Juan than Pratt did. Pratt did better on Orcas than Byers did. The next vote tally will be posted at 5pm today. We'll analyze the results, and put up another post later. Yes ... today is the big day. We'll know (probably) this evening who will move on to the general election in April. In assorted news (while we wait for the election results), the Planning Commission and the County Council held a joint session yesterday. It was reminiscent of meetings about solid waste before the citizens of this County finally got so fed up with Public Works that we took solid waste operations away from them. Planning Department staff could not have been more unhelpful yesterday. Nearly every request put to them was met with rebound requests for more staff and more money. As mentioned, we saw this sort of behavior from the old solid waste staff in the days before their downfall, where no request was too small for the County to turn down using "resource constraints" as the excuse -- not even the installation of a suggestion box at the waste facilities was doable. The Planning Department has now decided to fall into the same role, and apparently, it won't work on anything that it doesn't want to work on. They just hired another full-time planner, and despite "completing" the CAOs, they have no time or resources to work on any Council or Planning Commission request. Funny how that is. I think it's time we looked at a new organizational model for the Planning Department just like we had to look at a new organization model for solid waste. The Exchange on Orcas has burned down. That is such a shame. You can find more about it here and here. At least no one was hurt. No one was hurt, but it hurts. Today has been a busy news day, with evolving stories, so only sketchy details are available. We'll tell you what we know thus far, but bear in mind this is preliminary information. 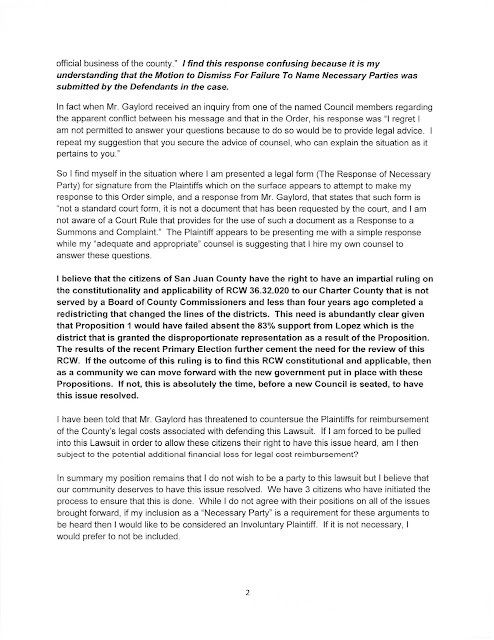 First, although Tim Blanchard was approved to sit on the Planning Commission by a 6-0 Council vote, some opponents of Blanchard's appointment are complaining that the San Juan County Code (SJCC) requires appointment by the Chair of the Council in order for the appointment to be official. Consequently, even though Chair Jamie Stephens voted for Blanchard's appointment, Stephens is getting pressure not to appoint Blanchard. Frankly, there probably isn't a single person on the Planning Commission appointed according to the letter of this law. If Blanchard's appointment is questionable, then the appointment of every current Commissioner is questionable as well. Next up regarding sketchy news of the day, Councilman and candidate Bob Jarman is reportedly in the hospital undergoing heart valve replacement surgery. We wish Jarman a speedy recovery and quick return to health ... and an expeditious return to the Winter Council as well. Next on the list is the awaited deposition of Jon Cain in the lawsuit concerning the Open Public Meetings Act (OPMA) and the CAOs. 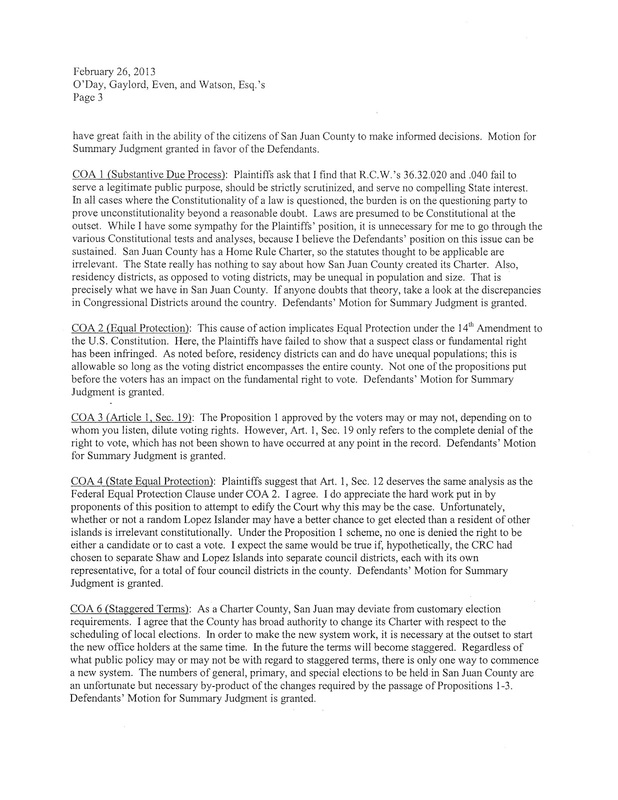 This is the lawsuit brought by the Citizens Alliance for Property Rights (CAPR) against the County. Deputy Prosecutor Cain's deposition was scheduled to occur this week, but it has been postponed. Reportedly, Prosecuting Attorney Randy Gaylord is unwilling to proceed without a subpoena. That can be arranged, apparently, and the deposition is likely to occur later this month. Lastly, Ron Zee, who is already Conservation District President, Head of the Madrona Institute (which is the fiscal agent of the Stewardship Network), and until recently the Head of the local Democratic Party, has been proposed as a possibility to Chair the Action Agenda Oversight Group (AAOG) Local Implementation Organization (LIO). 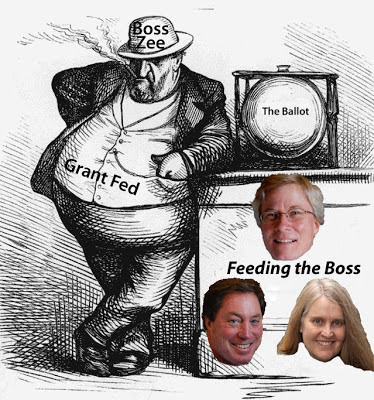 Translation -- Zee could become head of the local Puget Sound Partnership (PSP) organization that doles out grants to the non-profit he runs (Madrona Institute) which funds the PSP EcoNet (Stewardship Network) ... or the Network as we have referred to them in shorthand. If you remember from earlier posts, the Network is the collection of 24 organizations that were paid by the PSP to spread specific messages about our environment and economy. Controversy about Blanchard? ... when Ron Zee's overlapping connections to state and local government are dizzying? Don Pollard has a great letter in the Island Guardian about nonpartisanship. Howie Rosenfeld says that everything is partisan. What do you think? The appointment of Tim Blanchard to the Planning Commission is getting a lot of attention. Blanchard is on the Board of the Common Sense Alliance (CSA), and he replaces Evelyn Fuchser, whose term expired. Fuchser was on the Board of the Citizens Alliance for Property Rights (CAPR). 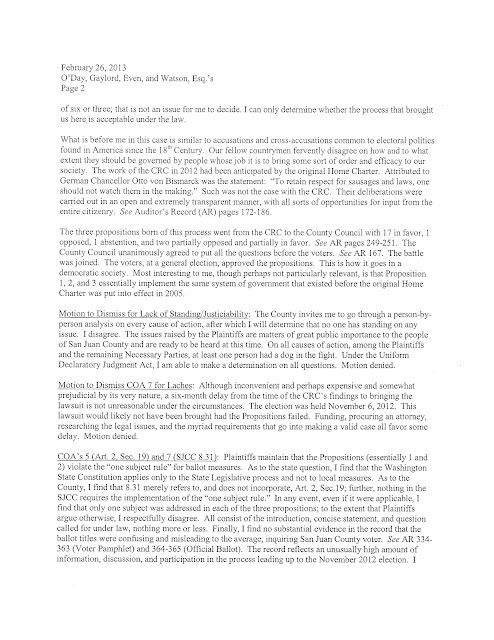 Blanchard's appointment caused David Dehlendorf (husband of a Planning Commissioner) to send an apoplectic email to the County Council, objecting to Blanchard's appointment. You can read Dehlendorf's screed here. Dehlendorf is concerned about CSA having too many members on the Planning Commission, but if Dehlendorf had examined the voting records of the "CSA Planning Commissioners," he would have realized that they have not voted as a bloc -- not even regarding the CAOs. The people who have voted as a bloc on the Planning Commission have been most of the non-CSA, non-CAPR members. Susan Dehlendorf, Barbara Thomas, Bob Gamble, Stephen Adams, and Karin Agosta almost always vote the same way, and nearly all of them are involved in the campaigns of Byers and/or Pratt. Why the sudden concern for balance on the County's committees? For me, the fuss is reminiscent of the racial integration of schools back in the 50s, with Dehlendorf playing the role of George Wallace standing in the schoolhouse door. Goodness, we can't have integration here. That would destroy our way of life! Blanchard just wrote to the Council in response to Dehlendorf's letter. Have a look. I am writing to address recent assertions by David Dehlendorf that I failed to "fully and properly" disclose potential conflicts of interest in my application to serve on the Planning Commission. (San Juan Islander, Feb 6, 2013.) I am at a loss concerning the relevance of much of Mr. Dehlendorf's letter, but wanted to make clear to Council that my disclosure of potential conflicts was "full" and "proper." I am a member of the Board of Directors of the Common Sense Alliance (CSA), a nonpartisan, nonprofit, 501(c)(3) organization. As its website states, CSA "provides the vehicle through which information can be provided to citizens and government alike, allowing citizens to be more engaged in our charter government and requiring government to follow established law and process to provide fair and enforceable laws for Islanders." www.commonsensealliance.net. In my application, I identified CSA as an organization in which I "serve in a decision making capacity," and further disclosed my service as an officer of the Board. I do not serve as CSA's "principal attorney." Neither I, nor my firm, have ever been engaged as legal counsel for CSA or provided legal advice to CSA. Public comments that I have made on behalf of CSA were made in my capacity as one of CSA’s vice presidents. 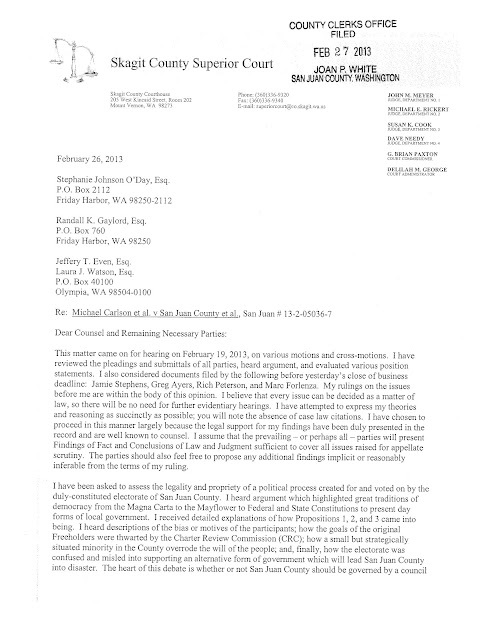 I am not a "party to a lawsuit against the County." Nor has CSA initiated a "lawsuit" against the County. CSA recently filed administrative appeals with the Growth Management Hearings Board, in furtherance of its public comments regarding the recently adopted Critical Areas Ordinance provisions. I am not sure why Mr. Dehlendorf was unaware of the vacancy on the Commission. The regular vacancy notice and request for applications were posted on the County website and I believe the terms of Planning Commission members have also been consistently listed on the County website. The Washington PDC has updated tallies for our candidates. Byers and Pratt continue to lead the field with $21,671 and $19,041 respectively. We keep mentioning how different these two campaigns are from all the others, but of course, the candidates themselves (and their supporters) don't see it that way. Have a look at their answers to the Eagle Forum, for example. Pratt tries to deflect criticism by saying that 33% of one of her opponent's campaigns (Bob Jarman's) has been financed by a Board Member of the Common Sense Alliance (CSA). However, Bob Jarman has a paltry 12 contributors compared to the 153 (i.e., the 1%) highly-linked contributors for Pratt. In Byers' Eagle Forum answers, she says that she has received no campaign funds from the Friends, and as an organization, that's true. The Eagle Forum might have more accurately asked about her connections to the people comprising the Stewardship Network. In the spirit of fairness, let's look at a summary of who is donating to Byers campaign. Remember, this is on top of the expansive connections already described in one of our earlier posts regarding Byers' (and Pratt's) Campaign Committee. Is there anything wrong with active citizens playing multiple roles in our community? Well ... sometimes yes. When the same people become entrenched for years as a virtual ascendancy, then there can be potential problems. But many ordinary citizens are wondering if something more fundamental is going on. It looks for all the world like the eco/conservation crowd is hooking up with the Community Land Trust crowd to re-engineer our entire economy and island way of life. Are we crazy for having those suspicions? Maybe not. Consider the following. Alternative economy? ... relationships and specific projects to coalesce around? ... seems like one more thing in this county that makes you go "hmmm." In addition to being Executive Director of OPAL, Byers is the President of the National Community Land Trust, and she is part of the New Economics Institute, which is a heterodox economics organization. We're not talking Keynes versus Hayek ... we're talking Schumacher and people who believe in degrowth -- and as appealing as some aspects of that philosophy may sound to some, most of it is simply an anti-capitalistic power grab disguised as eco wholesomeness. We'll have more about that in future posts, but to get rolling, have a look at an excerpt of Byers from a New Economics Institute Conference in New York from last June. By the way, Byers starts off with a quote by Thomas Paine that (we believe) she misconstrues. We'll have more about that too in later posts. This is a developing story so this posting will change as details emerge. Today, the Common Sense Alliance (CSA) filed appeals with the Growth Management Hearings Board (GMHB) over the General, Wetlands, and Fish and Wildlife CAOs. In a separate move, the PJ Taggares Company, a property owner on Blakely Island, also filed an appeal. Both parties are represented by Sandy Mackie of Perkins Coie. 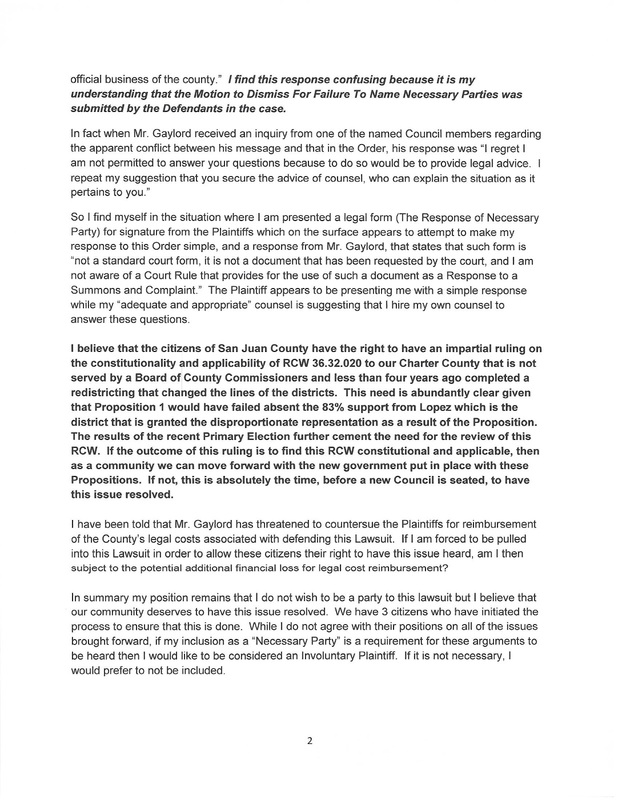 Unlike the Friends of the San Juans, both of the new appellants had vigorously urged the County not to pass the CAOs until the alleged substantial flaws could be remedied. In addition to elections and Community Conversations, the County has been having workshops about the new CAOs. Already, there has been one workshop in Friday Harbor, and there will be another on Orcas on February 6. We've heard some candidates say how much easier the new CAOs are, but that's not how it appears to people who have attended the workshops. In a letter to the Journal, Paul LeBaron has captured in a nutshell how "easy" our new system is. The CAO will certainly create several high paying jobs throughout the county. The new Pre-Application Evaluation Questionnaire has 24 technical questions and costs $400 to file. The $400 fee will be the least of your worries, since you will probably need to hire a surveyor, geologist, biologist, land use attorney, and wetland expert if applicable. This will become more difficult if you are within the shoreline. Once this form is completed you can turn it into the county for review. If by chance their experts agree with your experts, you are ready to go back to the planning department to fill out the Land Use Pre-Application Evaluation Worksheet. This is a 6-page questionnaire with 78 technical questions to be filled out by several of your highly paid consultants. Couldn't be easier! Just do all that, and faster than you can say "Kyle Loring," you'll be on your way to the next phase of your project -- confronting a Hearing Examiner challenge by the Friends. Ahh, the good life. But really, it's better, just listen to the candidates. The CAOs are logical, and I guess some people aren't frightened by unbridled regulatory discretion. I've sentenced boys younger than you to the gas chamber. Didn't want to do it, but I felt I owed it to them. It's time to finish the CAO. You've got a roadmap. You've had many wonderful comments that have been provided to you. It's unlikely that the next two groups of decision makers sitting in your seats over the next five months will be able to complete more than the previous three councils before you. It's time to finish the CAO. It's time to stop the financial hemorrhage. It's time to stop the conflict. It's time to complete and create certainty for our community. Certainty is good for our economy and our environment. 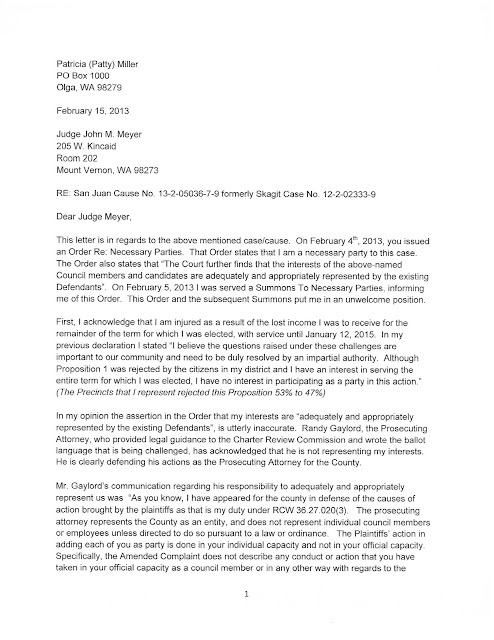 How is filing an appeal before the GMHB consistent with any of the words spoken by Buffum? It isn't. If the Friends felt the CAOs were so inadequate as to require a GMHB appeal, why did the Friends stridently urge approval? Besides, weren't the Friends (such as Janet Alderton) advocates for some of the more complex and inscrutable aspects of the CAOs? Who knows what game the Friends are really playing, but it isn't protection of the environment. They just like to mess with people. Pass the CAOs, so we can appeal. Got a B&B CUP permit? ... we'll oppose that. Want to grow blueberries on your own property? ... we can manufacture a situation where that's illegal too. We're the Friends. We can do anything. We sit on all the important committees. We're the lifeblood of the Network. And we'll get taxpayer money (grants) to mess with you too. Just try to stop us. From what we've observed, the Friends seem not to be an environmental organization so much as they seem to be professional bullies, and they want our County government to devote all its energy towards aiding and abetting their harassment mission. Vanity of vanities, saith the Friends, vanity of vanities; all is vanity. What profit hath a County of all its CAOs which it maketh under the GMA? There is no remembrance of former things. All the committees run into the Network; yet the Network is not full: unto the place from whence the CAO come, thither they return again. Here's the press release the Friends sent out today. 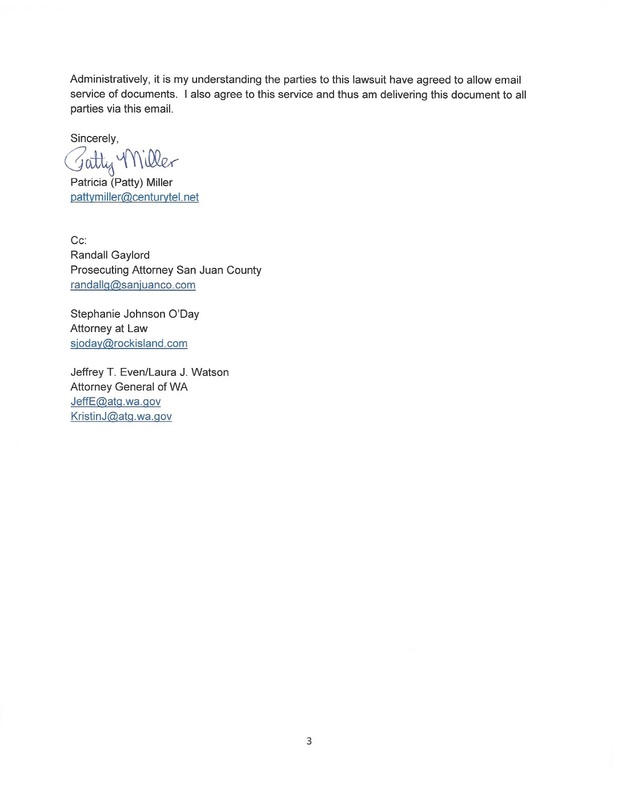 The FRIENDS of the San Juans has appealed the Critical Areas Ordinance update that San Juan County adopted in December 2012. The FRIENDS press release on the appeal to the Growth Managment Board (Board) states the " filed the appeal in an effort to stem the steady, incremental and cumulative degradation of local waters and wildlife. Eelgrass disappeared from 82 acres of embayments between 1995 and 2004. Puget Sound Chinook salmon, Southern Resident Killer Whale and sea bird populations continue to decline. Shoreline trees and shrubs that deliver insects to salmon, and tidal marshes that provide them homes, have also declined significantly over the years."